Lakefront views of Lake Erie & Islands, Great Spring & Summer Getaway! Fantastic Lake Erie views! Winter/Summer Getaway & great location! This lake view 2nd floor condo features comfortable furniture and many amenities with amazing lake and island views! Beautiful sunset and sunrise views from the condo property! Full well-appointed kitchen w/all appliances and everything needed to stay in and create your own meals or plenty of excellent restaurants nearby. Private master bedroom has a king bed, living room has a comfortable leather sofa and love seat, and sunroom is furnished with both queen and twin sleeper sofas easily converted to beds for a semi-private second bedroom with vertical blind partition. We recommend parties of no more than 4-5 (one bathroom). No large parties or events please. Enjoy vacationing in Port Clinton! 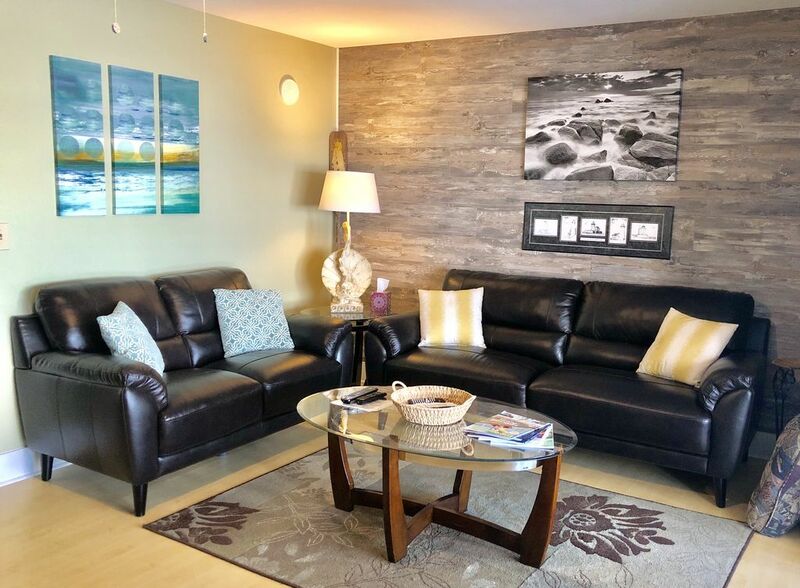 Our Lake Erie getaway condo is within a short walking distance of the Jet Express for your island excursions, Dock's Beach House Restaurant with live entertainment and tiki bar with beach, Mr. Ed's Restaurant and Bar, and Jet Ski rental across the street. It is also a short walk to downtown Port Clinton with many great restaurants, shops, and public beach. Near wineries, farm markets, and wonderful nearby parks for hiking and birdwatching! Close to nearby attractions such as Cedar Point, Marblehead Lighthouse, African Safari Wildlife Park. There is much to see and do in the area and a great place to go fishing and boating. Huge pool and hot tub with plenty of loungers and tables on the patio for your enjoyment! Enjoy the gas grills poolside and covered patio for outdoor dining. (There are also multiple charcoal grills throughout the condo complex.) Convenient changing room/bathroom in pool area. • Linens provided: sheets, blankets, bath towels, and beach towels. • Public boat launch about 1 mile west. • 30 minutes or less to Sandusky, Cedar Point, Kalahari, African Safari Wildlife Park, East Harbor State Park, Camp Perry, Ottawa National Wildlife Refuge, Magee Marsh, Ferries to Put in Bay, Middle Bass, and Kelley's Island, Marblehead Lighthouse, Lakeside Chautauqua, Perry's Monument, Liberty Aviation Museum, Mon Ami Winery, and other fantastic area wineries and breweries. The lake views are amazing and a wonderful place to just relax and unwind or many activities and attractions to enjoy in the area! Best pool in the area! This condo has been a popular rental for years with all positive reviews and high ratings. We want to keep improving on this great rental history and make it an even more fantastic place to stay so you will want to come back again and recommend us to your friends and family! The condo complex is well-managed with beautiful landscaping and the pool area right outside our door is fantastic! This is the best location you can find in Port Clinton–you can walk to Jet Express and downtown, sit on the beach right in front of the condo and watch the sunset or jet ski or walk down to Dock’s Beach House for a drink in the tiki hut on the beach! We even have a 30' dock for boating! The view of South Bass Island (Put-in-Bay) from this condo is outstanding! You feel like you are at a vacation resort with the fantastic pool/hot tub/picnic area and beautiful landscaping of this property. Our condo is spacious and very comfortable. On breezy days with the windows open and waves splashing you get wonderful lake breezes throughout the condo (and this is why we've named it "Lake Breeze!") We're happy to share our place with you so that you will enjoy your stay as much as we do! Watch the sunset or look out over the lake with views of Put-in-Bay from the large windows of your sunroom. Watch the sunset or look out over the lake with views of Put-in-Bay from the large windows of sunroom. Good heating system and comfortable during cold weather months. Sheets, blankets, pillows in King bedroom and also in sunroom cabinets for queen and twin sleeper sofa beds. Laundry detergent, spot cleaner, and fabric softener provided. No assigned parking so may park anywhere near unit, however, we ask that keep number of cars in parking lot to a minimum. Bath towels, hand towels, washcloths, beach towels in bathroom. Dish towels and cleaning cloths in kitchen. We have wifi and will provide wifi information at condo. Well-stocked dishes, glass and plasticware and utensils. Large dining table in dining area for 4 (expands to 6) Small dining table in sunroom seats 2. Wall stereo speaker system throughout condo with cable for Smartphone/iPod music. Soundbar has Bluetooth connectivity. DVD players in master bedroom and in living room. Many board games in bedroom closet wicker cabinet and top shelf. Mini table-top pool table in bedroom closet. Some children's books and small toys in cabinet under living room TV. Many board games to enjoy. DVDs/DVD players in bedroom and living room and we have streaming content (Netflix, etc.) on both televisions. Condo complex has gorgeous landscaping to enjoy. We do not provide bicycles but there are bicycle racks on condo property if you want to bring bicycles to enjoy during your stay. 30 ft. Dock Available (Please inquire with hosts.) We do not provide boat. Fantastic condo community resort-style pool area with loungers, grills and picnic area, and many grassy areas around complex to relax. Condo is on 2nd floor so there are stairs to climb. (No elevator.) No assigned parking. May park anywhere. 30' dock available by request–Portage River launch is 1 mile down the street. Boat trailer parking for a small fee is available next door to condo complex at Brand's Marina-within walking distance. (No trailer parking at condo complex!) Within walking/biking distance: Jet Express ferry to the islands (save on parking! ), Dock's Beach House Restaurant/Tiki Bar, downtown Port Clinton right across the bridge (many great bars, restaurants and shops), jet ski rental right across the street near Dock's. We so enjoyed our Lake Breeze getaway in last week in March on the shore of Lake Erie. The condo view is breathtaking and Jim and Katy could not be more gratious and organized. Their tips of places to visit and to dine were right on. It’s cozy, romantic, and soul refreshing! Katy and I are so glad your family enjoyed the condo. We take great pride in providing everything you need for a relaxing stay. We think the views of the lake and Islands are the best part of the stay. The off season is a great time to visit. From ice shoves to 6 foot waves, the sun room couch is your front row seat to these spectacular scenes. There are amazing places to eat and drink only a few minutes away so everything is close. We hope to see you back again during the summer months so you can enjoy the pool and hot tub. Thank you for staying with us. We are happy that you enjoyed the condo and were able to enjoy the many wonderful restaurants nearby. It was a very nice place with all the amenities of home. Owners are very nice and ask how they can make your experience the best that it can be. We really appreciate that you booked with us and happy that you enjoyed your stay! We really try our best to make our condo as comfortable as possible for our guests! Come back anytime! Outstanding condo right on Lake Erie. We had a lovely stay right on the lake! We came to see Lake Erie frozen and spent our time in this cozy, well equipped condo! The bed was so comfortable. Everything we needed to cook was in the kitchen. And the sofa facing the lake was my favorite. Owners were a dream to work with. Highly recommend this condo for a lovely experience! Thank you very much for your review! We want people to enjoy themselves as much as we do when we stay at the condo. Winter is an amazing time and we always enjoy a cup of coffee while watching the lake and relaxing! Very quiet and serene. Great for a quiet weekend getaway. Very clean and well kept. The views were beautiful. Thank you! We’re so happy you enjoyed your stay at our condo! Thanks for taking such great care of our place and we hope to see you back again soon!